My name is Roger Bonati. Nine years ago, I was diagnosed with ALS. Three years later, I discovered it was Lyme disease. How could this have happened and how can others avoid it? I’d suspected Lyme from the beginning, but every time I went to the doctor to get tested, the standard Western Blot Lyme test came back negative. I even had this test done recently and it still came back negative. The first time I noticed symptoms was in early 2004 when I was having fine dexterity issues. My dexterity issues kept progressing. By 2008, I sought medical attention and in 2009, I was diagnosed with ALS. By 2012, I started noticing eye lid fasciculations. According to the ALS researcher I saw at the Columbia University neurology department, neuropathy and eye movements are not effected by ALS. After my diagnosis, I had a lengthy conversation with him about the mechanisms of ALS and what it effects. Being a science nerd I was asking detailed questions. Remembering those earlier conversations, I knew there was more than that going on. I had suspicions of Lyme from the beginning, but at this point I started seeking a real Lyme literate doctor. I had my first appointment in September of 2012 and tested positive for Lyme from Igenex test lab https://www.igenex.com/. My doctor started me on an oral antibiotic but I didn’t notice anything positive. If anything, it felt like things were getting worse so I stopped after 9 months. After looking up alternatives and discussing them with my doctor I decided to try the IV antibiotic. I started in the beginning of December 2013 and within the first few days my heart rate was elevated, I was experiencing minor hallucinations and was waking up disoriented every night. My doctor confirmed that I was having a huge Herxheimer reaction, where the antibiotic breaks down the bacteria releasing toxins. The fact that the reaction was so large indicates the bacteria level was high meaning it was in my system for a long time. This was unmistakable and really freaky because I was deteriorating very quickly. At the time I was excited because I thought that I’d found a fix, however, what I didn’t realize at the time was that when Lyme is your system too long it becomes chronic and is no longer treatable with current antibiotics. In December, I was still going to work myself, able to type on a keyboard and able to climb in and out of my wheelchair myself. By January of 2014, I was rushed to the hospital for emergency surgery for a trach and have been vent dependent since. By February, I lost most of my remaining mobility. By March, things had stabilized and I wasn’t declining anymore. At the end of May of 2014, one of my nurses accidentally pulled on my trach and it started to bleed so I was rushed to the hospital. There they said I had a blood infection then a UTI, so they blamed everything including my pick line and they removed it. Since I had already been on the antibiotic for 6 months and was stable, I thought I was good. Within 2 months, I was feeling mild neuropathy, I had a light tingling feeling in my limbs like they were falling asleep. This started progressing rapidly and I started getting fasciculations in my face which were also progressing rapidly. By September, I restarted the antibiotic and the neuropathy progression and fasciculations stopped. For 2 years I was relatively stable, I noticed only a slight progression and the tingling advanced just a little bit. In November of 2016, my doctor left his practice for a full time job in a hospital which is when I stopped the antibiotic. Approximately 3 months after, in February, is when the tingling advanced to real neuropathy pain and started advancing quickly. By March, I started getting the fasciculations in my face and eye lids again. Since July I’ve been having difficulty keeping my eye lids open enough to use my eye-gaze computer without straining them. Around the same time I started having difficulty swallowing and drooling for the first time, before this I’d swallow like an animal. Also around the same my speech has been declining rapidly, I’ve sounded like a bug for a while but before this point I was understandable and able to speak full sentences. About a year after being on disability, I joined Facebook for the first time and became part of a few ALS groups. I’ve noticed that a relatively small percentage of them have very similar issues in common with myself. All are relatively slow progressors, complain about widespread neuropathy, have eye movement and/or eye lid weakness, and complain about something they call acid tears. I wouldn’t call it acid, but the PH definitely shifted since January of 2014, shortly after the trach my eyes will burn every time they tear even slightly. There comes a point where these are no longer coincidences but there’s an underlying cause. It may not be the strain of Lyme that the western blot looks for but it’s definitely a similar bacterial infection. My goal is to get the ALS testing protocols updated so that we can at least save some people from going through this. The Igenex test was the only one that came up positive for me and was also recommend by one of the Lyme associations. It was when the neuropathy pain and eye movement issues hit me for real is when I realized how many others are in the same situation. I reached out to people on Facebook with my story and even more people came forward with similar symptoms and some even had the same reaction to the antibiotic which they would not have had had without a bacterial infection. When I presented this information to my doctors I was either ignored or they just looked at me like I was a loony and said no it’s ALS. I guess they’ve only read one book and there’s no other cause of nerve damage in our universe. The problem is that as soon as they see nerve damage they’re writing people off and saying you have ALS get your affairs in order. There is no direct test for ALS, so if they see progressing nerve damage you automatically get lumped into that bucket. I have found a few doctors that agree with this but they’re in no position to help ALS patients. I’d also reached out to one of the Lyme associations and was told that there were many documented cases where people were diagnosed with ALS but were proven to have Lyme disease. We’re talking about a relatively small percentage of ALS patients in this situation, but if we can save anyone from going through this it would be great. The problem with the protocols is that the Western blot Lyme test misses the strain of Lyme that mimics ALS. The Lyme association recommended the Igenex test lab that specializes in tick borne diseases because they do a broad spectrum Lyme test that detects this strain. I’d also reached out to the head of the ALS association about updating their testing protocols but they will only accept a full reversal as proof which is a problem when Lyme has gone chronic, which is why it’s important to catch it early enough to be treated. My only goal here is to save at least some people from going through this. I know that my situation could have been avoided if it was caught in time, I’ve had this for over 14 years now. This is why it’s important that this is caught as early as possible. Knowing this to be true, I have to do everything possible to save as many people as I can from going through this and I will not just sit back and watch people suffer unnecessarily if this is avoidable. Even though I’m vent dependent for more than 4 years, I’m still working part time as an electrical engineer for the power supply group of the collider-accelerator department at Brookhaven national laboratory. A big part of my job is trouble shooting large complex systems and designing solutions to fit the desired outcome. I’m really good at this which is why I’m still valuable to them in spite of my situation. I currently use my eye-gaze computer to do programming to analyze the various power systems. From my office computer I can access the control systems and collect data samples. No Quit – Let’s Find a Cure for Chronic Lyme! Even though the odds are slim, I’m still looking for a cure for chronic Lyme. It’s part of my engineering disorder where I have to fix everything. I may be angry about this situation but I’ll never give up. I don’t even know what that means. Qwit is not in my vocabulary – see, I can’t even spell it. So that’s my situation. If you have any questions or comments your input is always welcome. I agree with Roger Bonati that Lyme should be ruled out in all patients. Although ruling out Lyme is considered part of the differential diagnosis of ALS, most studies conclude that Lyme is a rare cause of ALS. However, they are only using the ELISA and Western Blot testing which when positive is 95% accurate, but unfortunately only 44-56% sensitive, thus giving false negatives. Also, this test cannot diagnose chronic Lyme infection Most authors and clinicians that study and treat ALS are only using the Western Blot if they suspect Lyme in patients who live in endemic areas, and they surmise that unless there are clear signs of Lyme infections diagnosed, there is no need to test for past infection or use other diagnostic tests for chronic subclinical Lyme disease. Keep in mind that although 14 states contain 95% of all Lyme cases, only 8 states have no confirmed cases. For patients that test negative on all Lyme testing, including WB and LM-PCR, they can test for Tick Borne Relapsing Fever (TBRF) Western Blot with IgeneX which is a sensitive indicator of relapsing Borrelia infection in cases of chronic Lyme. Coco Newton, MPH, RD, CCN is owner of Lifetime Nutrition, LLC, a private practice in Maple City, Michigan. Her expertise is in Functional Medical Nutrition Therapy (FMNT) for prevention and treatment of chronic diseases and syndromes. She is a frequent presenter for professional and public audiences. Coco received her Bachelor of Science (BS) degree in Dietetics/Community Nutrition from the University of California (Davis) and her Masters of Public Health (MPH) in Nutrition from the University of Minnesota. She completed her dietetic internship at the University of California (San Diego) and is registered dietitian (RD) through the Academy of Nutrition and Dietetics. She is a Certified Clinical Nutritionist (CCN) and is board-certified through the International and American Associations of Clinical Nutritionists. Coco co-founded and served on the Institute for Functional Medicine’s Nutrition Advisory Board from 2007-2011. In 2010, she co-founded the University of Kansas’ Nutrition Fellowship Program, a collaborative program through the University’s departments of Integrative Medicine and Dietetics & Nutrition. Coco advocates for legislative parity in licensure for nutrition professionals. Coco served on the Michigan Board of Dietetics and Nutrition from 2007 to 2013, championing the successful repeal of the anti-competitive and discriminatory Dietetics/Nutrition Licensure Law on July 1, 2014, the first repeal in the United States. Currently, her concentration is in the study and application of FMNT for the treatment of neurodegenerative diseases, especially Amyotrophic Lateral Sclerosis (ALS). My name is Roger Bonati, I'm 53 years old and married with 2 daughters, 8 & 11. I've always wanted my own family so when my doctor told me to get my affairs in order a month before my younger daughter was born, I wasn't having it. I've lived on various parts of long island, new York my whole life. I was diagnosed with ADHD back when it was called “oh boy your kid is hyper”, I was 7. I’m an electrical engineer and have worked for the collider-accelerator department at Brookhaven national laboratory since 1988. I've been an engineer since I was a child, always fixing things or building contraptions that would scare my parents. my family was very hands on so growing up I always being taught how to figure things out and make repairs. throughout school I worked a large variety of construction jobs. this added to my training because I never needed a contractor for anything, I'd fix everything myself. I always use to keep a large bag of tools in the back of my truck and would frequently fix things for my family and friends free of charge, it was fun for me. I've always been a very active person and enjoyed a variety of outdoor activities including biking, skiing on large mountains, and hiking. always being able to fix everything adds to the frustration of the doctors telling me there's nothing we can do, I'm not use to that. I am so impressed with your tenacity and intelligence. 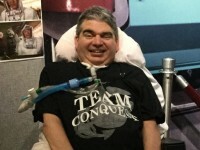 You are an amazing person, and it is people like you and Craig that make clinicians like me want to go to battle to help control or conquer ALS. Your goal to help others avoid the path you’re on is compassionate and courageous. I have a chapter being published (450 scientific references) in a medical textbook coming out 1st quarter of 2019. It will be the first ever ALS chapter that addresses nutrition, toxins, the gut, microbes, and many other factors that affect PALS. My expectation and hope is that I will be invited to speak at many conferences, hospitals, etc. I will use your article that Craig posted and read from it to encourage doctors to wake up, listen, and learn. Thank YOU very much for what you wrote. It will be a part of everything I try to do for PALS and to influence the clinicians who serve them. thank you so much for your kind words all of your help with this. please let me know if there’s anything I can do to help get this point across, I will volunteer for whatever you think is necessary. it’s horrifying to think how many people are suffering when it could have been avoided if it was caught early enough to be treated. I will never give up on this. Roger…you are truly an inspiration..someone to be so admired for your fight, and always in good humor. I wish you nothing but the best is this quest you are on. You will help others. I have known you from the time you were born as I have been a good friend of your Mom for years going back to the 50’s. You are and will always be in my prayers…as well as your beautiful,family. For accuracy it should be noted that there have been cases of eye lid weakness with ALS, especially in the advanced stages. But when you combine eye lid weakness with widespread neuropathy, burning tears, and eye movement weakness, there’s definitely something more than just ALS going on. I’m dedicating this project to help others to two great men that have been taken from us, Andre Williams Sr. & Scott Barrow.